New photos of a recent highway construction in China could be part of a contingency plan to invade North Korea or amass a huge army on their shared border. Experts fear this newly uncovered plot could stoke the fires of World War 3, inevitably involving the United States. According to The Express UK, communist China has traditionally been North Korea’s closest ally, but Kim Jong-un’s continued nuclear and ballistic missile tests have tested Beijing’s patience on the rising tensions worldwide. These new revelations also come as North Korea was spotted transporting 30 Scud missiles from Hwangju, south of the capital Pyongyang, to Nampo, on the Korea Bay coast opposite China. New photos have emerged and they reveal that the Communist superpower is building a six-lane highway in its desolately populated northeast on route to North Korea. With most Chinese peasants not able to afford the luxury of a car, the construction of the G1112 Ji’an–Shuangliao Expressway, has led experts to believe it will be used for quick deployment of tanks and troops to its North Korean border. The photos obtained by Daily Star Online show Chinese construction workers digging tunnels through the mountains and massive cranes constructing bridges over rivers. 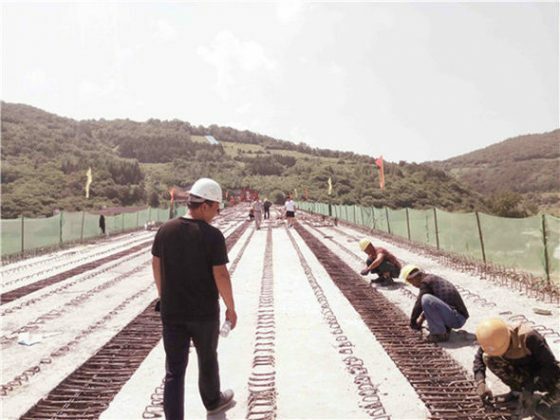 Chinese workers construct a six lane highway to North Korea’s border. Dean Cheng, an Asia security expert at the Heritage Foundation, a think tank in Washington, said Beijing would have a ”vast array” of contingency plans involving military options to seize Kim Jong-un’s nuclear weapons. And just last week, a highly respected security think tank warned that the threat of war between China and the US was now real. In the bombshell report, the Rand Corporation said any conflict between North Korea and South Korea and the US would quickly spiral into World War 3. If it’s decided upon by a nation to “take out” the North Korean dictator, Kim Jong-Un, American and Chinese troops would then rush across the border in a race to take control of the tyrant’s nuclear weapons and missile facilities colliding in a clash between China and the US, effectively spawning WW3. A whopping 85% of North Korea’s nuclear facilities are believed to be located within 62 miles of the Chinese border. China actually threatened the US with a “real war” last month. The communist nation said that Donald Trump had made a “serious miscalculation” over North Korea. Photos uncovered by a North Korean monitoring site suggested China was secretly helping Kim’s nuclear missile program. But there were other confusing and conflicting signs that North Korea may be preparing to fire missiles towards China next week. It looks like the world is steamrolling its way to a third world war.